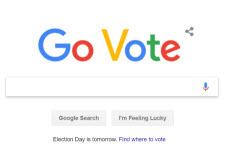 Ads on TV, phone calls during dinner, and now, even the Google doodle is reminding us to vote - and it's only the midterms. This level of fervor is usually reserved for presidential elections that come only every four years. eBay also urged members of its "Main Street" program to vote through an email this week that provided links to resources including instructions on how to find local polling places. We haven't seen any reminders from tech or ecommerce companies that instruct people for whom they should vote. But it's become common practice for them to advise users on certain issues as they arise. For example, eBay and Etsy have been lobbying Congress to pass federal sales-tax legislation, and many tech companies weighed in on the Net Neutrality debate. This is the most important time of year for most sellers, and we can only hope that after being inundated with campaign ads and reminders to vote, people will wake up on Wednesday eager to engage in some retail therapy. Go Shop! I think the reminders to vote are very good. I've got to say I'm pretty tired of seeing all the ads for those that are running for specific offices and other things that we are about to vote on. But that is normal. They get more and more of these ads the closer we are to an election. While I tire of all these ads, they are important for those that may be on the fence about something or it may inspire them to do more research. Whatever it takes to get people out there to vote. I get real tired of hearing people complain about one thing or another, but they are unwilling to take the time to vote. In my mind, if you don't vote, you don't have the right to complain about who is in office or what initiatives get passed or failed. If you want to be heard, speak up and do your civic duty. Many people have died over the years to get and maintain our right to vote. Why would you throw it away willingly?? No, I'm not tired of the REMINDERS and ROADMAPS to lead infrequent voters thru the twists and turns to know the details on when to vote, where to vote and even to KNOW before standing on line TODAY only to find that YOUR STATE might or might NOT have changed the details on what is necessary to have firmly IN HAND at the final roadblock to voting. NO, I am not tired of the reminders as this is not ''ONLY THE MIDTERMS''. This is more like Deutschland in 1932. Voted Absentee in September. Straight Repub. Keep the tv tuned to all the upper channels and never see a lie by any politician. Never! It is a privilege to vote. What frustrates me is when folks don't vote and folks who vote against their own interests based on ideology. Perhaps these commercials will have an effect on some who would not otherwise vote. What I don't like are the mean spirited candidate commercials that are filled with lies. As far as I am concerned the candidate who endorses such commercial whether directly or indirectly is responsible. I live in a state that has been in the national spotlight as it relates to one of its races. I've seen enough mean spirited commercials to last me to 2020. If someone has to be reminded 100 times to go vote, they probably shouldn't. It would tend to indicate that it's unlikely they're familiar enough with the issues to make an informed decision! "This is more like Deutschland in 1932." No, it's not. Nothing at all like it. "I've seen enough mean spirited commercials to last me to 2020." I agree. Unfortunately, the candidates persist in this kind of advertising for one reason alone - they know from the data that it works. Which probably means that the fault, dear Brutus, is not in our stars, but in ourselves. Given the state of the modern media, it's more incumbent on each and every one of us than ever before to look past the blaring headlines and do some actual research into the issues. With the internet that's actually easier than ever before, yet I'd bet we do it less than ever! "This is more like Deutschland in 1932"
I am inclined to agree with this. How many of those ego rallies have there been? Between 70 and 100? Who is running the country? I am sick of hearing about it. Both Republicans and Democrats are no good and I have already voted. If the commercials just stated "Go Vote," I'd be happy, but the constant barrage of 'Candidate X is akin to pond scum' just gets to be too much. And after today, we can look forward to non-stop Medicare supplemental plans until early December, which are even more annoying. 100% chance I'll be voting today! We have a gas tax to repeal, a new Governor to put in office and a couple of dimwits for Senator to vote for! I am tired of all of this. I can see why people don't vote. No matter which party gets power nothing happens except that their cronies get more power. Several people out in the wide world said they weren't voting. If you don't think your vote is important enough to matter, there will always be plenty of despots-to-be willing to agree with you. For your own good, naturally. And if you can't yet appreciate the sacrfice of those who have fought to achieve and preserve not just the ''right'' to vote, but the meaningfulness of it in the context of a government ''of the people'' - and especially elsewhere, no less defiant for it's frailty - then it will come to pass indeed, that your opinion will no longer matter. Nobody likes to be nagged of course. But if you don't need this message, it's easy enough to ignore. And if you do, it is too. Not to decide, is to decide. I myself have had zero phone calls , though many emails. whether through ignorance, disinformation, DENIAL or all of the above. While I respect all well intentioned viewpoints. I have no respect for the lying to and manipulating of the American people or those who enable it for personal gain.